It was not only Scottish pride that was dented after they lost 9-6 to England at Murrayfield, the almost priceless Calcutta Cup itself came in for some rough treatment as Scotland's John Jeffrey and England's Dean Richards (a policeman in the real world) kicked the 110-year-old trophy down Edinburgh's Princes Street. The outrage could not have been more had it been the Queen Mother instead of the cup, with some calling for life bans. As it was, Jeffrey was banned for six months and Richards for one match. "It got horribly damaged," Richards said. "I remember JJ saying: 'Look, it's not in a very good state'." Jeffrey admitted it was a mixture of alcohol and high jinks. "I think I had sobered up a bit by the time I got back to the hotel. 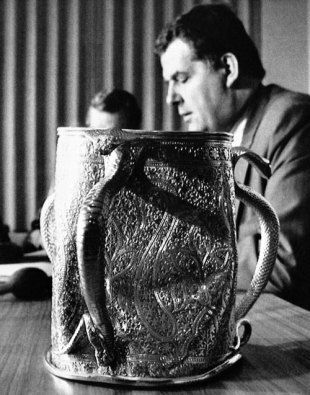 I remember looking at the cup and thinking, 'hmmm, we could be in a spot of bother here'." Scotland prop Norrie Rowan said: "There was nothing malicious, they were just passing it around like a rugby ball, but because they kept on dropping it, it just got really bent. The last time I saw it, the doorman at [Edinburgh nightclub] Buster Browns had a broom handle through the lugs of the cup and was trying to wedge it back into shape." John Scott's captaincy debut in charge of England ended with a 22-12 drubbing by Scotland, and Scott was slammed by the Guardian as a "disaster … he failed to lead, inspire or direct" and he further blotted his copybook with a right-hook at a line-out which gave Scotland a simple three points. It was only Scotland's fourth win in 31 visits to Twickenham. England prop Matt Stevens revealed that he was to quit his club, Bath, after being banned from rugby for two years for failing a drugs test. He tested positive for metabolites of cocaine following Bath's Heineken Cup win over Glasgow in December 2009 and was banned by a European Rugby Cup panel from all levels of rugby, including coaching and training. "I have to do the honourable thing," Stevens told The Times. "I am quitting before they sack me. I want to spare the club who have been so good to me. I can't thank the coaches enough for the support they have shown me, and the players. Everyone has been magnificent. Again I can only say how sorry I am at letting people down." Former Ireland coach Eddie O'Sullivan took up the reins as head coach of the USA national team following the departure of Scott Johnson. O'Sullivan previously worked for USA Rugby in the 1990s as a technical director and assistant before returning to Ireland. After graduating into the role of Ireland's head coach he led them during a hugely successful period, winning three Triple Crowns between 2004 and 2007. Following a disappointing Rugby World Cup in 2007 and a poor return in the 2008 Six Nations he resigned his post as Ireland coach. It's not how you win that matters … Wales secured the Triple Crown for the first time since 1979 in an instantly forgettable game. In windy conditions, Paul Thorburn missed four penalties, Ireland's Michael Kiernan five, but it was a kick from Thorburn almost four minutes into added time that was enough to secure a 12-9 win for Wales. The Rugby World Cup Sevens kicked off in Dubai. All of the major sides survived day one, with England surviving an early scare from minnows Hong Kong. Leicester and England wing Tom Varndell was among the try-scorers for Ben Ryan's side after being released for the tournament by his club. England's 18-14 win in Paris was their seventh successive victory over the French and their fourth in a row in the French capital. To put that into context, no other side had won in the Five Nations in France for 19 years. England arrived under fire for not being able to score tries, rocked by the sudden resignation of manager Geoff Cooke, and stung by a defeat against Ireland. But five penalties and a drop-goal from Rob Andrew was enough to secure the win. England beat Scotland 5-0 in Edinburgh to win the Triple Crown, William Bromet scoring the game's only try. Their Test season ended without them having conceded a single point in their three matches. England's selectors showed a bout of indecision when they named a three-quarter line featuring three AN Others for the Calcutta Cup match at Twickenham. They explained that they needed to watch the following weekend's County Championship final between East Midlands and Middlesex before deciding. Six inches of snow in as many hours during an already freezing winter caused the Wales against Ireland international at Swansea to be postponed by three weeks. Wales's selectors made no fewer than ten changes to their side to visit Ireland following a defeat against Swansea a month earlier. It was to little effect - they lost in Dublin as well. Loughborough beat Durham in the UAU final at Twickenham, their ninth university title in 13 seasons.